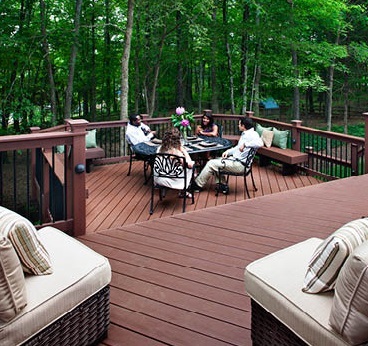 Nowadays, it almost doesn’t seem natural to see a deck without a pergola. A pergola has become a welcome companion to the backyard deck. 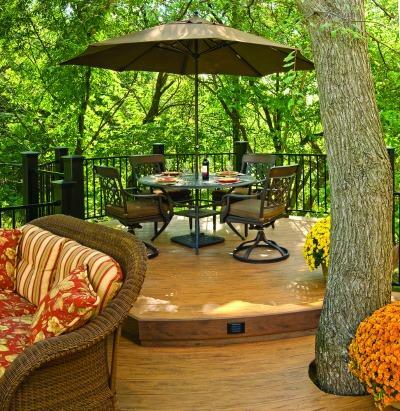 It serves not only as a focal point of interest and beauty, but can also add valuable shade to that sunny spot on a deck that receives a great deal of afternoon sun. 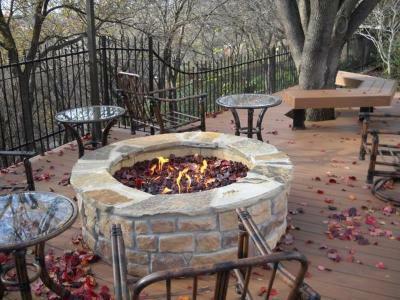 Pergolas also make a great way to flank the addition of other backyard amenities such as an outdoor kitchen addition, or to add privacy to a hot tub deck. 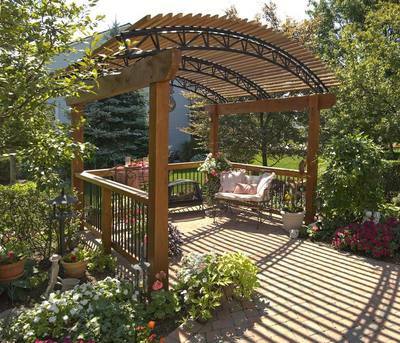 The popularity of the pergola is nothing new, and is evident throughout history. 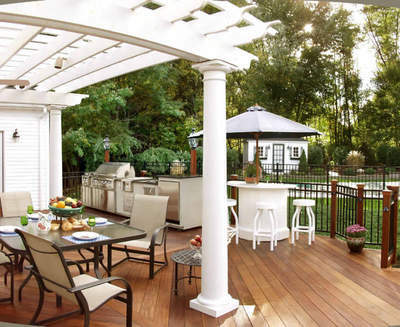 The word pergola is derived from the Latin word “pergula,” which means a “projecting eave,” commonly found as an extended roof or arbor. The first known use of the term pergola dates back to the 1640s during the late medieval period. It was used by John Evelyn at the cloister of Trinita dei Monti in Rome. During this same time, Eastern Asia was creating their own pergola structures featuring curved beams that emulated the arched characteristics of their pagodas. 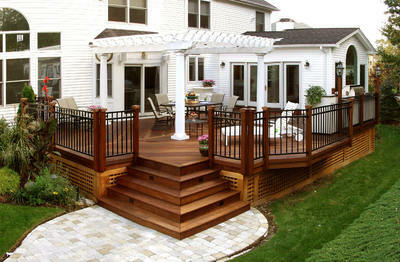 Large deck with white vinyl pergola. Though you can see traces of the pergola’s origins in some of today’s modern pergola designs, the range of materials used to construct pergolas is now much more vast. 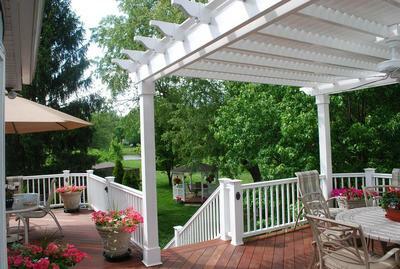 Low-maintenance materials like vinyl and fiberglass offer homeowners a pergola that will stand the test of time. 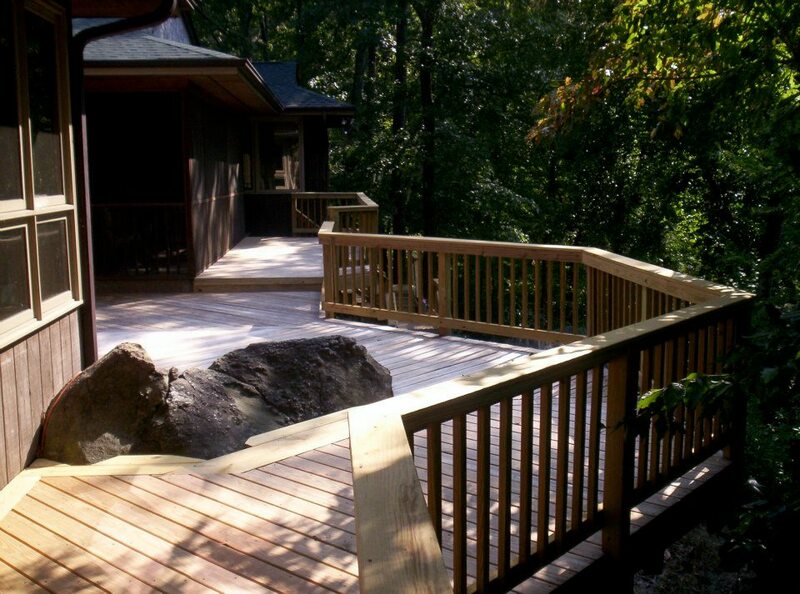 In addition to low-maintenance pergolas, Archadeck of Central SC also offers pergolas built from a wide range of wood mediums as well as resilient aluminum. 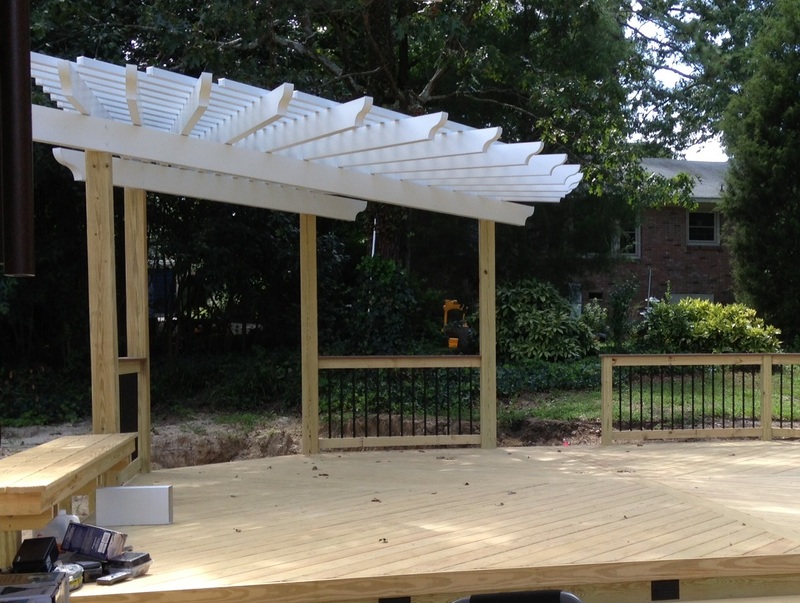 Archadeck of Central SC is currently wrapping up a project that features two stunning custom pergolas as part of a deck and pergola combination in West Columbia, SC. 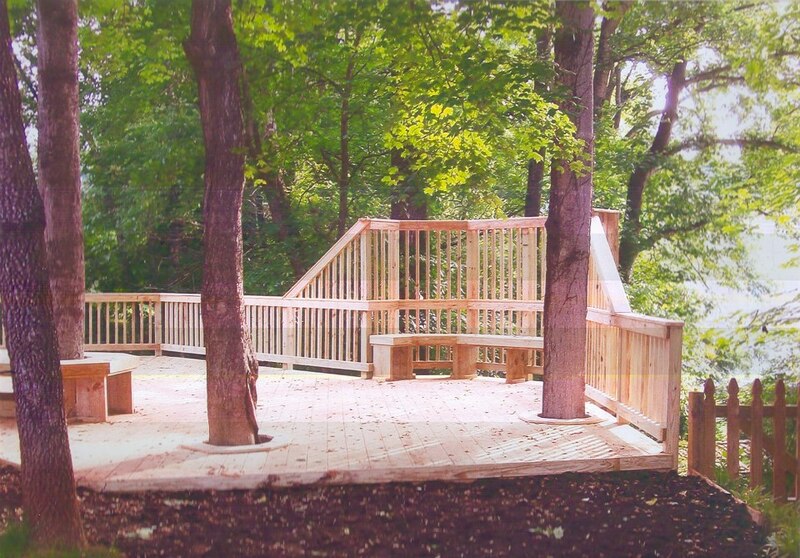 Attached wood pergola follows shape of deck. Our pergola designs can be as simplistic or ornate as our customers see fit, from two-beam, or four-beam, wall mount or detached designs, the choices are endless. 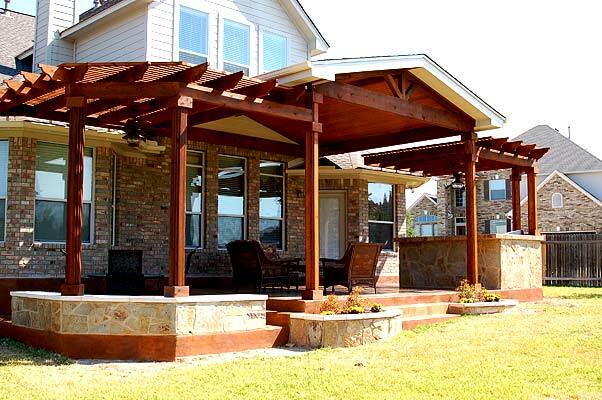 When it comes to using the pergola as a shade structure, the construction of the pergola is key to making the pergola more conducive for adding shade. This is achieved through the spacing between the cross beams located atop the pergola and by using wider rafters in the pergola design. The closer the beams are set, or the wider the rafters, the more sun protection your pergola will offer. All of these factors are influenced by the intended placement of your pergola in correlation to the direction and amount of sunlight your location receives. 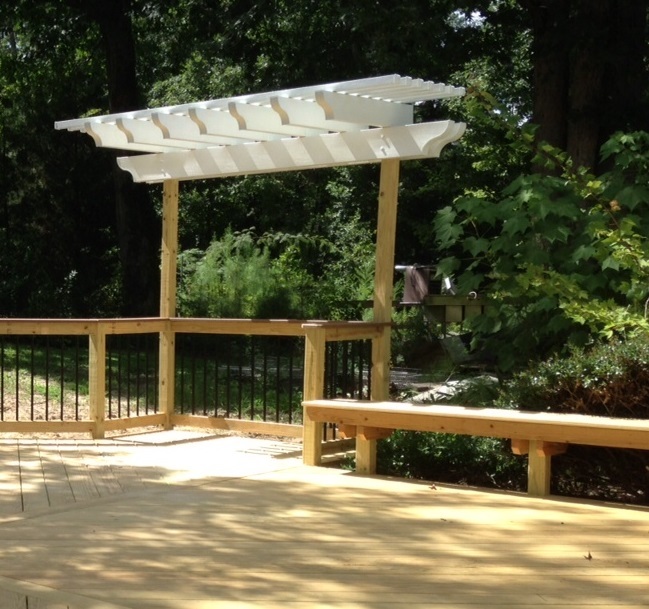 Archadeck of Central SC offers many ways a pergola owner can increase the sun protection while keeping the original design of the pergola intact. We have many options available that can be customized to deliver the most shade and comfort to your pergola and deck addition. Details of one of two custom aluminum pergolas which grace this wooden deck in West Columbia, SC. Pergolas provide a huge benefit for homeowners in search of a shade structure that will still allow sunlight to penetrate their interior living spaces. Loss of light is a concern for homeowners when considering a covered porch or outdoor room addition. Roofed structures don’t allow as much sunshine into your interior living spaces as does a deck and pergola addition, which can enhance the mood and flow within your home. 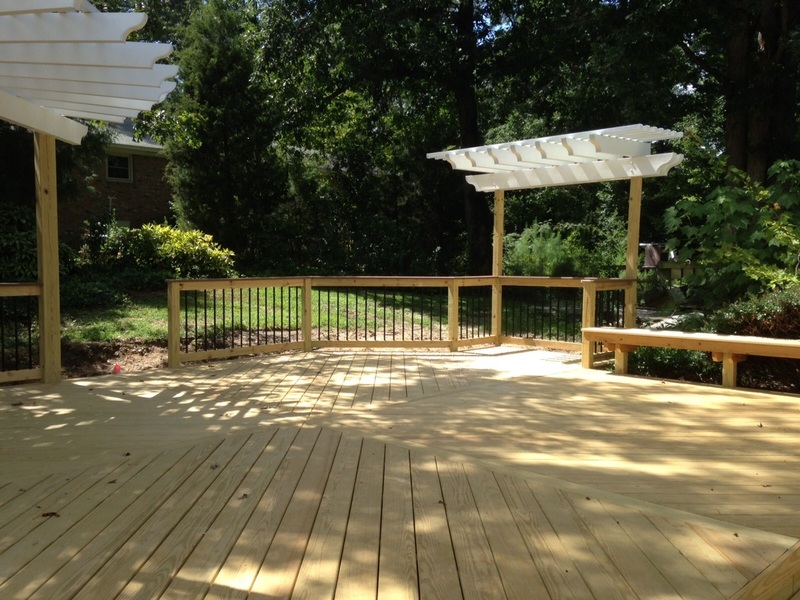 A deck and pergola addition will to allow sun to flow freely into your home and will also influence your heating and cooling costs throughout the season and especially in the winter. 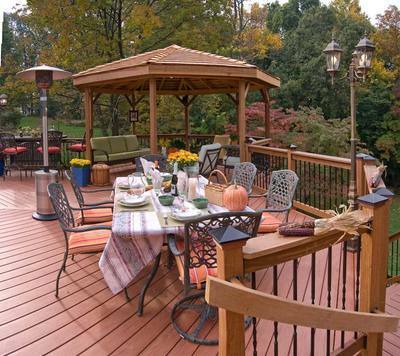 This is an often overlooked benefit of choosing a pergola and deck combination! 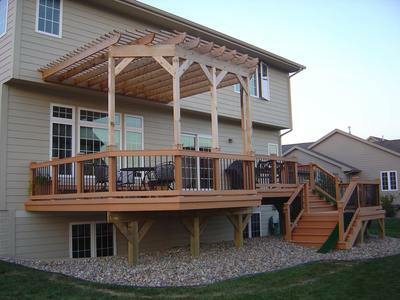 You can see more examples of pergola and deck combinations by visiting our deck photo galleries and our pergola and trellis photo gallery located on our website. 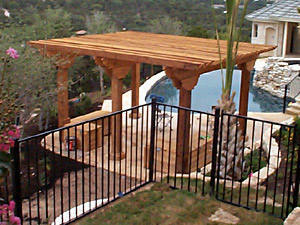 This entry was posted in Custom pergola designs, Deck and pergola combinations, Decks and tagged Archadeck of Central SC, Archadeck of Central South Carolina, Central SC combination outdoor living spaces, Central SC custom deck and pergola combinations, Central SC deck and pergola combinations, Central SC deck builder, Central SC deck designs, Central SC outdoor living combination builder, Central SC outdoor living combinations, Central SC pergola builder, Central SC pergolas, Central SC pergolas as shade structures for decks, Central SC Privacy decks with pergolas, Central SC spa decks and pergolas, West Columbia SC aluminum pergolas, West Columbia SC beautiful pergolas, West Columbia SC custom deck and pergola combinations, West Columbia SC deck and pergola combinations, West Columbia SC pergola builder, West Columbia SC pergolas on August 21, 2013 by archadeckofcentralsc.